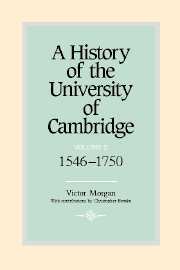 This four-volume history of the University of Cambridge offers a scholarly account of social, political and intellectual developments within the University from its foundation in the thirteenth century to the present day. All aspects of University endeavour are covered, from the formation of academic curricula, to sporting and recreational activities. The history also contains much appealing biographical material, giving a human face to institutional development.